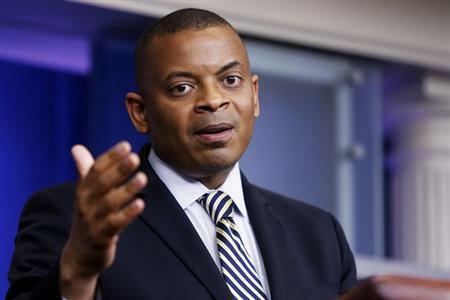 WASHINGTON (Reuters) - When Anthony Foxx took over from the hard-charging Ray LaHood last July as U.S. transportation secretary, he had big shoes to fill and needed to adjust from his job as a city mayor to presiding over a sprawling agency with 55,000 employees. Less than a year later, Foxx, 43, has emerged as an up-and-coming talent in President Barack Obama's Cabinet, a central player in Obama's effort to persuade Congress to approve new transportation funding and who just last week fined General Motors $35 million for safety violations linked to 13 deaths. "Crashes happened and people died," Foxx told a news conference in announcing the penalties. It has been a speedy rise for Foxx, a former mayor of Charlotte, North Carolina, who got Democrats' attention in 2012 when his city played host to the Democratic National Convention where Obama was nominated for a second term. Foxx does not have the flair for the dramatic like his predecessor, Ray LaHood, a former congressman from Illinois whose verbal outbursts on issues such as distracted driving made national headlines. But after a tentative start he has become increasingly more visible, briefing reporters at the White House and appearing with Obama at the aging Tappan Zee Bridge in New York state last week to argue for increased transportation funding. LaHood likes what he sees so far in his successor, saying Foxx has "really gotten up to speed quickly" and that his call for more transportation money is just what is needed. "The U.S. is a joke right now," LaHood told Reuters. "The country is one giant pothole because of the devastating winter we had and nobody in Congress is stepping up and doing what we need to do, which is pass a bill." Foxx, who like Obama is African-American, brings an outsider's view to the president's Cabinet meetings. "He just brings a good perspective to the Cabinet," said a senior White House official. "Obviously a lot of folks at the table have a variety of experiences, but he was recently outside of Washington and was an executive." Foxx's main job in coming months is to sound the alarm about what the Obama administration sees as a critical priority: Providing funding for transportation projects by the end of September. The administration has proposed $302 billion over four years and Foxx is warning that unless Congress acts, up to 700,000 Americans will lose their jobs over the next year and various road and bridge projects may be delayed or shut down completely. Some of those involved in the transportation industry were disappointed that the administration's proposal to replenish the Highway Trust Fund does not raise the gasoline tax but instead relies on the uncertain prospects of corporate tax reform as a funding stream. An aviation lobbyist said that while Foxx clearly understands the ins and outs of the transit system, he will need to learn more about transportation safety. "I don't think he came into the job saying he's a safety guru, and that should be the primary focus of a transportation secretary. I'm not critical of him, but I just think he's somewhat of a neophyte," said the lobbyist, who asked to remain unidentified. Others, however, saw Foxx's fine of $35 million on GM as a sign that just like LaHood before him, he understands the need to be forceful about highway safety. "I think what it tells me about him is that they are totally on top of this issue inside the department and that they're sending a message that this won't be tolerated," said Marcia Hale, president of Building America's Future Educational Fund.